Social media never ceases to surprise us. A YouTube video surfaced and it caused four Egyptians to get arrested last Saturday. A video titled “Four Al-Azhar Students Mock Copts” was filmed in the home of one of the students in Al-Sharqiya governerate last week. According to an official statement by the Egyptian Interior Ministry, the video showed four people; one of them is a student at 6 of October City’s religious institute and another student at Al-Azhar’s institute in Sharqiya. The video’s content was mocking Christian religious prayers and hymns. Following the arrest, the students stated that the video was for comical reasons and posted another YouTube video apologizing to the Christian community. One of the students stated that he was inspired by a satirical Facebook page called Primo that posts political, religious, and economical content. Authorities are currently taking necessary legal actions against the students. According to Al-Ahram, Al-Azhar University officials have referred the institute student to a disciplinary committee, and have denied that the student has any connection with the Ministry of Religious Endowments officials in Sharqiya, as claimed by some on social media. 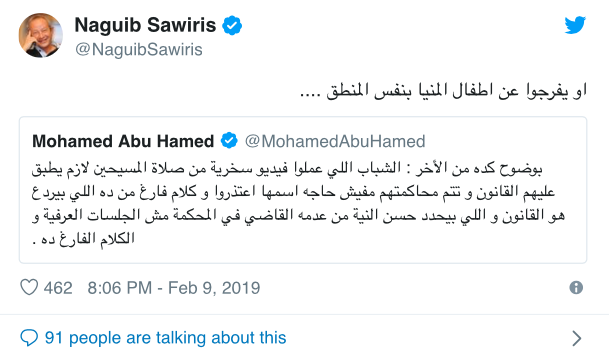 Egyptian business mogul, Naguib Sawiris, took to Twitter to ask for equal treatment and release of the Coptic students who were sentenced five years in jail for mocking Muslim prayers in another viral video that was posted back in February, 2016.